Before the internet, buying records was often a gamble. You typically bought an album based upon 1 or 2 singles you'd heard, and it seemed like half the time you got boned in the process. A good album was one which had 3 or 4 tracks on it which you really liked. 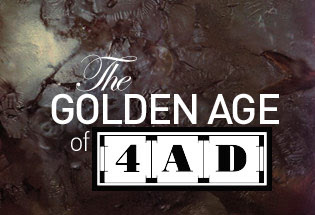 Well, when it came to the record label 4AD during the span of time which the tracks above represent (roughly 1986 to 2000), the number of excellent tracks per album was consistently higher than most. I soon got to the point where I would buy just about any album they manufactured without having heard a single note. While the rest of the kids were worshiping disheveled boys from Seattle and Chicago, I was playing the holy crap out of that live Michael Brook album (see the track "Red Shift" above). I hated grunge (still do) and I remain bitter that it distracted attention away from bands like Pale Saints. Don't even talk to me about Nirvana and Pearl Jam...although even I have to admit that they seem charming compared with the stuff which has usurped them. I'm aware that there are some glaring omissions from the set list (The Pixies, The Birthday Party, and Bauhaus, for example). You're welcome to complain about it in the comments. Related: The Concise Guide To The Cocteau Twins. we were in our early 20's when grunge came around, so we were already way too old for it. That stuff was for teenagers. I don't think it took any attention away from the 4AD bands, because that type of music isn't as marketable to a large audience. Not enough hate. A few days ago NPR interviewed the kid who was on the cover of nirvana's "nevermind" album. He's now 17. He was lamenting about not getting to experience the 90's himself: "these days, all anyone cares about is myspace and facebook. Back then, if you wanted to play in a band, you started your own. Now, people just play 'guitar hero' instead".